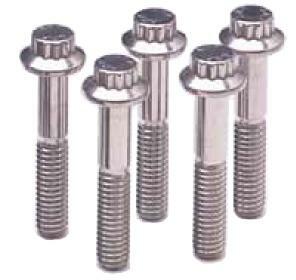 615-2750 - ARP Fasteners - 12Point Bolts - Dezod Motorsports Inc - Home of the automotive performance enthusiast since 2002. Now you can use premium quality ARP stainless steel or chrome moly fasteners to install most anything on a car, boat or trailer. The specially alloyed “ARP 300” stainless steel and heat-treated 8740 chrome moly bolts (black oxide finish) are nominally rated at 180,000 psi tensile strength to provide a substantial extra margin of safety over Grade 8 hardware. What’s more, you can’t beat the gorgeous looks of ARP’s specially polished stainless steel fasteners, and their ability to resist rust. They’re truly maintenance free!